Online measurement of Calorific Value (CV), BTU and Wobbe Index (WI) in Natural Gas has been a major requirement in the natural gas industry. Customer requirements regarding accuracy, speed, and speciation vary by application. Major technologies for the measurement of CV include Process Gas Chromatographs (PGC), catalytic combustion with residual O2 measurement analyzers and inferential/physical properties analyzers. In addition, niche and emerging technologies include Mass Spectrometry (MS) and a range of photometric techniques in both the near and mid infrared regions. Of the emerging technologies, widely tunable Quantum Cascade Laser (QCL) systems operating in the mid infrared offer the most promise, providing a unique blend of real time BTU / CV / WI reporting, without the consumables and maintenance of a PGC, and importantly with speciation not available from inferential or catalytic combustion analyzers. The main online analytical technique for HPI and related industries for over 50 years has been the process gas chromatograph (PGC). The PGC is the automated version of gas chromatographs used extensively in laboratories around the world. At a programmed frequency, it extracts a sample (usually in the gas phase) which is injected into the column system and detected, component by component, after separation. PGCs are very useful, powerful gas analyzers, having potentially the capacity to analyze any mixture of components, provided they can exist in the gas phase at temperatures below 200 degrees C. PGCs do, however, have fundamental limitations. First, PGC analysis takes time to separate complex mixtures, and analysis times of multiple minutes are the norm. One solution is to add valving with back flushing or even a second column, but this tends to exacerbate a second problem – i.e., long term unattended reliability requiring relatively expert on-site maintenance. Second, PGCs require consumables such as carrier gas or H2 fuel for Flame Ionization Detectors (FIDs). Helium, a particularly useful carrier gas where Thermal Conductivity Detectors (TCDs) are used, has become rare and expensive. H2 as a fuel for FID equipped PGCs has the obvious safety concerns. It is possible to burn a fuel and measure the heat emitted. This measurement principle is based on the measurement of residual oxygen after catalytic combustion of the flare or fuel gas. A small sample flow is mixed continuously with dry air in a constant fixed ratio. This ratio depends on the gas composition and is determined on a case by case basis. Using an electrical heated catalytic oven, the air fuel mixture is fully burned. The residual oxygen is measured by a zirconium oxide cell. This residual oxygen content, which equates to that remaining after the fuel has been combusted, provides a measurement of the Combustion Air Requirement and correlates well to the Wobbe Index of the gas. This method also requires a density measurement to enable calorific value determination. Like PGCs these analyzers have lifetime cost of ownership concerns. Zirconia sensors are a consumables, operating at high temperatures (> 600 degrees C). These catalytic devices need periodic replacement. In addition, this technique does not provide speciation. Because of the fundamental difficulty of measuring the individual contributors to calorific value quickly and accurately, alternative techniques have been developed where physical properties of the gas are measured and correlated to calorific value. These inferential techniques involve creating a model which can relate these measurements to an overall calorific value. Such methods tend to rely heavily on the model assumptions. A weakness is that fuels, even where just described as natural gas (NG) or liquefied natural gas (LNG), can vary quite considerably and model based techniques cannot encompass every possibility. In addition, they do not provide for speciation. Mass Spectrometry is a much-used laboratory multicomponent technique but has been significantly less successful than PGCs in moving into the online area. Cost has been one factor along with high maintenance requirements and the need for skilled operators. Reliable pumps are needed to support a high vacuum but such vacuums are not favored in process analyzers. MS, more than any other technique, requires a fully characterized stream, as unknowns can corrupt the calibration model and normalization routine. BTU analysis by mass spec has historically been limited to the niche applications of natural gas feeds in ammonia and methanol plants. MS is also the most demanding in terms of sample conditioning as either a pinhole leak, frit or capillary (30 micron ID) is used to restrict flow from sample pressure to the required MS high vacuum. Sample inlets are easily blocked by liquids and particulates. Infrared spectroscopy (IR) has for many years been a widely used and reliable technique for online gas analysis, having the benefit of much simpler and faster operation than gas chromatography. IR analyzers can in principle measure any component with at least two different atoms in their chemical structure (and possessing, consequently, a dipole). Process IR has been mostly non-dispersive (NDIR). 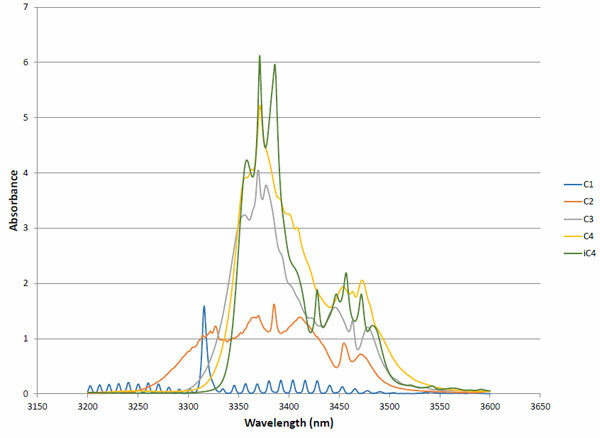 That is, individual absorptions often selected by optical filters (Figure 1) have been used to select wavelengths corresponding to specific absorptions of required components. Several optical filters can be used (one is often a baseline reference), each one selected to correspond to the absorption of a required component. Dispersive analyzers, such as Fourier Transform Infrared (FTIR) based analyzers, where the whole spectrum can be scanned and many more components can be measured simultaneously, have not been widely used for online analysis in the hydrocarbon processing (HPI) industry, due mainly to cost, complexity, and durability. The practical issue with NIR analyzers is interference. Many compounds will have multiple absorbances in the IR spectrum at different frequencies (related to the number of ways the molecule can vibrate) and the consequence is often a very crowded spectrum for a mixture of molecules. Further, similar molecules like alkanes (simple single bonded hydrocarbons), all featuring the same dipoles (C-H and C-C) will have very similar spectra and be consequently difficult to measure individually (Figure 2). Figure 2 illustrates the commonly used C-H "stretch" vibration absorption at between 3.3 and 3.5 microns of methane, ethane, propane and n-butane. The absorptions are very co-located and difficult to measure by established process NDIR. Near IR Laser spectroscopy is now well established for process analyzers. These analyzers use tunable diode lasers (TDLs) derived from extensive work by the telecommunications industry and have mostly been applied for a single gas component measurement because they have limited tunability. These lasers operate in the mid IR region where the primary absorptions occur and which are typically an order of magnitude stronger than near IR absorption peak. 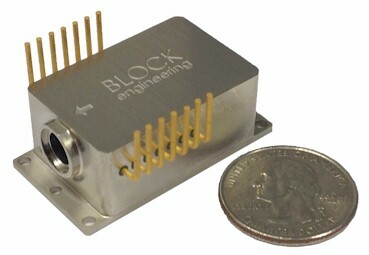 The Block Engineering QCL is widely tunable (i.e. is dispersive) which enables a much fuller view of the spectrum and greater potential to deconvolute interfering absorptions without the complexity of an FTIR (Figure 3). The Block Engineering QCL contains an external cavity QCL in which a moving grating tunes the wavelength, typically encompassing a 300 wavenumbers scan (Figure 4). Knowing each individual gas contribution, with therefore known density, enables precise calculation and continuous output of Wobbe. The Block QCL built into the LaserSense-CV (Block's BTU / CV application specific analyzer) can scan across mid IR hydrocarbon absorptions and derive individual alkane concentrations (Figure 5a, 5b). Percentage measurement ranges can be derived in one analyzer together with C6. This is ideal for typical natural gas compositions, but the principle can be generally applied to allow many useful applications in the Hydrocarbon Processing Industry. Results from a customer-defined challenge are presented in Figures 6a, 6b, 6c, 6d, and 6e. Figures 6b and 6c show excellent BTU and Wobbe accuracy, meeting nearly all user requirements. BTU accuracy being 0.5% relative or better and Wobbe Index accuracy being 0.2 % or better relative. As would be expected from such accurate BTU and Wobbe results, the individual component variances are within all but the most accurate PGC results, Figure 6e. The following summary table is a concise comparison of available technologies. Speciating hydrocarbons has proved attractive for many reasons. It can, for example, enable calculation of the methane number (a combination of C1, C2, C 3 and C4 concentrations) which indicates the engine knock tendency of a fuel. Infrared photometry has been significantly the fastest growing area of process analysis in recent years with not only the very successful near IR, single analyte tunable lasers but also near infrared Tunable Filter Spectroscopy. The advent of robust mid infrared widely tunable QCLs by Block has added a next generation capability to on line spectrophotometry by uniquely providing the speed, accuracy and speciation required for demanding applications. If you would like to discuss how Block's LaserSense-CV BTU/Wobbe analyzer can help with your application needs, please contact us.